Exclusive website price, including free shipping anywhere in Europe. Please ask for a quote if you are based outside of Europe. The Rebel II is a 2 speed belt drive turntable featuring some unique features. The Dual Plinth design (currently available in Black, Red or White) uses a revolutionary powder coat finish on a Medite core. This makes the Rebel II extremely hard wearin and gives a stylish and textured look and feel, which resists wear and tear and is very easy to clean and resisting fingerprints. The Rebel 2 comes with an upgradeable arm board, which means when you want to upgrade it is a simple case of replacing the arm board with another one that matches your new arm. 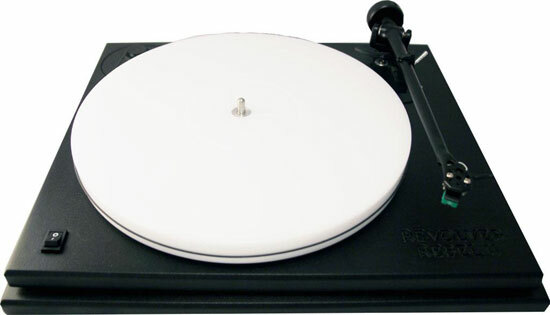 The turntable is supplied with a factory fitted Rega RB202 tonearm and an Audio Technica AT95E cartridge. Virtually a plug and play system direct from the box. The concept of the Dual Plinth design is to allow the record tracing system (platter, arm etc.) to be placed on the upper plinth whilst the motor etc. is connected to the lower plinth. The two plinths are connected in such a way the extranous movement is controlled in the direction of the record movement. Manual 2 speed change comes from an a.c.synchronous motor via a pulley to a heavy grade 23mm thick acrylic platter placed on a US made military grade stainless steel 440c / 360 brass with captive ball bearing, running in a lubricated brass housing. Throughout the turntable are used the best available British or US made oarts and manufacturing facilities. Produced to exacting standards. The Rebel II turntable, designed with the future in min, specifically for you. All New Revolver Rebel II Turntable at a glance. · Other Armboards possible in the future. Revolver Rebel II turntable including postage inside Europe. Website exclusive price, limited stock available £995.00 GBP.